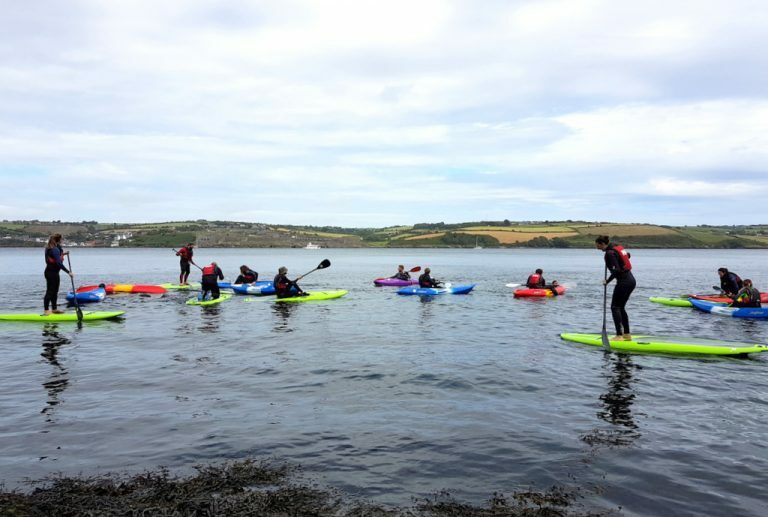 If you are looking for some hen and stag party ideas and something exciting to do for a day out in Kinsale, look no further than Kinsale Surf Adventures. We offer a great hen/stag party day out suited to any group -no matter what age and who are keen to jump in the water and give Surfing, Stand Up Paddle Boarding, Monster SUP or Coasteering a go, we can also provide a shuttle bus for 8 people. After 2 hours in the water most people have built up quite an appetite so why not join us for a fully catered beach BBQ. SHHHH!!!! We have a secret area that we love taking our clients. During this adrenalin filled & unique experience we will show you beautiful shallow coastal caves, hidden coves and little islands around our breathtakingly, rugged coastline. We will be swimming through sea caves, getting up close and personal to marine life, scrambling around the rocks, exploring around the sea cliffs while seeing part of the coastline you would normally never see. The grand finale brings us to an area where you will have the option to be jumping from a height suitable to you, (low-medium- high) into a beautiful blue ocean pool! Naturally, our qualified Instructors are first aid/CPR trained beach lifeguards & will ensure you get the very most out of your time, safely. We will take you on a journey that you will never forget. All participants will be provided with a personal flotation device, warm winter Roxy wet-suit and helmet. Let us put on a beach BBQ to finish your day! Stand Up Paddle Boarding is a popular option. We have a very special location which is sheltered, calm and stunningly beautiful which is the perfect location to launch our paddle boards. Stand up paddle boarding is great for any age and ability and a great way to spend a few hours out on the water (5 minutes from Kinsale) We will take you on a guided relaxing tour around the island and check out the surrounding coastline while exploring caves, taking in the scenery and getting close to the wild life. MONSTER SUP is the latest craze to hit the surf scene, and very popular with Hens and Stags. Monster by name Monster by size!! This BIG yet friendly beast brings team Stand up Paddle Boarding to a whole new level. Fun on a BIG scale ! Monster SUP is a giant inflatable paddle board. All you have to do is stay on and paddle! This is by far the most fun you can have as a group on the water! Monster SUP is a totally unique activity that has evolved from the rapid growth of Stand-up Paddle boarding. This is an awesome experience that everyone can take part in, with the help of our expert instructors. Party paddle the beast into waves or race or cruise on flat water checking out our amazing coastline as you go. There is even room for a picnic on the water! This is a great activity that the entire group can do at once and so much fun! !